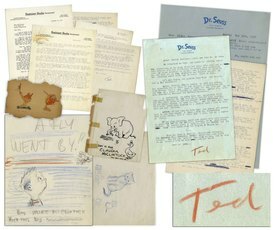 Los Angeles - Three letters and two pages of illustrations by Dr. Seuss will be auctioned by Nate D. Sanders Auctions on January 31, 2019. The letters and illustrations were directed to fellow author and long-time friend Mike McClintock. The letters were written in 1957, which was a blockbuster year for Seuss (Theodor Geisel) as both The Cat in the Hat and How the Grinch Stole Christmas were published that year. Dr. Seuss enthusiastically wrote about the success of his new books and addressed the marketing potential of toys and games based on his characters. The lot comes from the estate of McClintock, who wrote the 1958 children’s book, A Fly Went By. The lot also includes two pages of several illustrations by Seuss. Bidding for the lot begins at $3,500.